I think I’m just about ready to begin this BMW restoration. I’ve got the service manual, loads of new parts, a bunch of metal shaping tools, sheets of steel and a lot of backup via the excellent web forum at e9coupe.com. I can’t say enough about the quality and depth of the postings there. Spring is here and I’m finishing up the transmission project in the garage that’s keeping the E9 parked in the driveway. Many parts have arrived over the two years. Wow, it’s been that long… An order from Eastwood.com with a plasma cutter and orbital sander along with primers and paints are in transit to me as I write this. Space is still an issue in the garage. It’s a single bay with a row of shelves along one side. There are overhead racks storing boxes. There’s enough room to work, but once I start taking the car apart, the seats, dash, engine and transmission will have to go somewhere to let me work on the body. I’ll have to build another storage closet under the front steps to keep things under control. The 75 square foot shed I built in the back yard has helped a lot, and a few more things will fit, but it’s pretty full. It’s been a while since I’ve posted an update. Lots of things to do in the new house. Painting, installing new kitchen cabinets, etc. It’s winter now, so can’t say it’s too hot in the garage, a real problem in the summer. 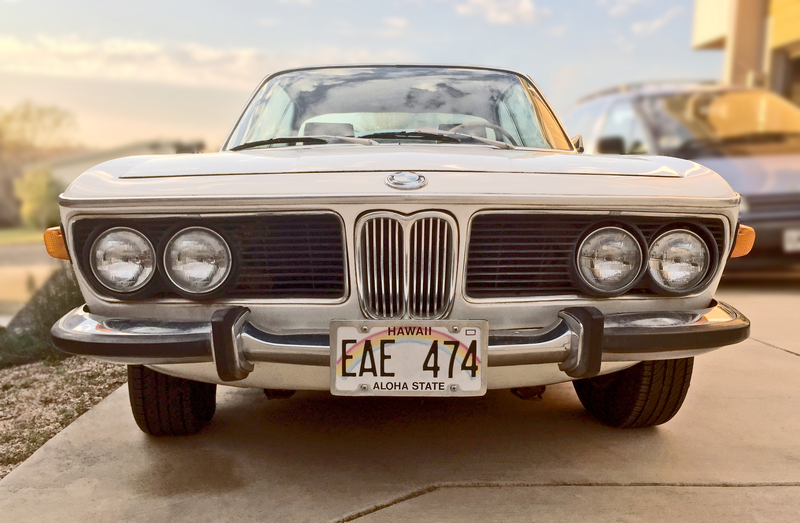 The E9 hasn’t been forgotten. Though it’s been under a tarp in the driveway most of the time, I did get to drive it to a small nearby town for some beer and bratwurst with some neighbors who also own old BMWs. I’ve been ordering parts that I know I’ll need when I get the car put back together. 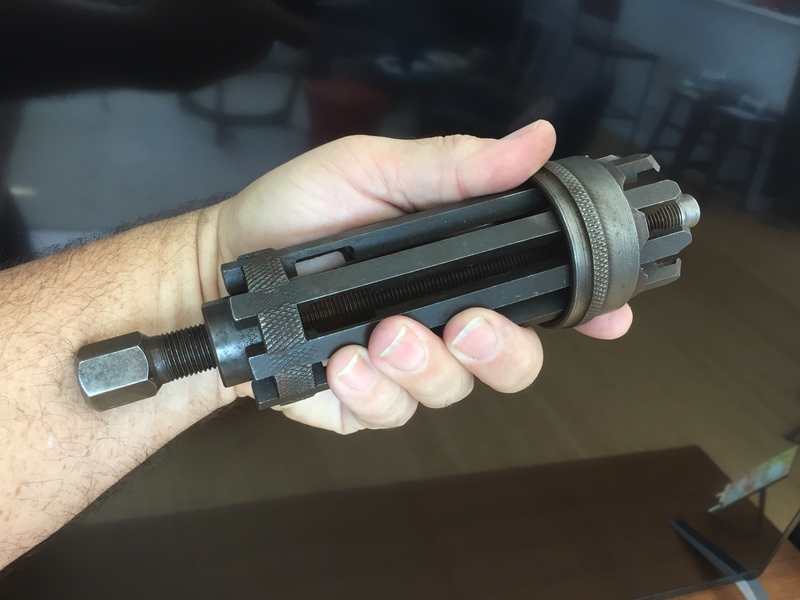 The latest find is a bearing puller for the input bearing in the transmission. I had almost given up finding one when my search on ebay came thorough with the exact model puller spec’d by the factory service manual. As long as the noisy bearing is one of the two 6306 bearings, I’ll be set. The smaller needle bearings are no longer available. My engineering friend tells me that the needle bearings spread the load and so should be more durable than the ball bearing roller bearings, so let’s hope that proves to be true. I have also bought a later cylinder head in case the original head is cracked. The early ones have larger openings and are prone to cracking from the exhaust valve seat to the water passage. I got one of the later heads, an ’82 according to its stamp, from a 6 series car. I hope I don’t need it, but I can practice setting the valves, which does need to be done to my engine. There are many other parts waiting to go in after the car get painted, new brake lines, rotors, motor and transmission mounts & seals, wheel and strut bearings. I don’t want to have lingering maintenance items, so I’ll take care of everything I can while I have the car apart. I bought a MaxJax car lift to assist in the restoration. It’s going to be a tight fit in the garage, but it will be worth it. I have yet to wire the garage for it. That’s next. 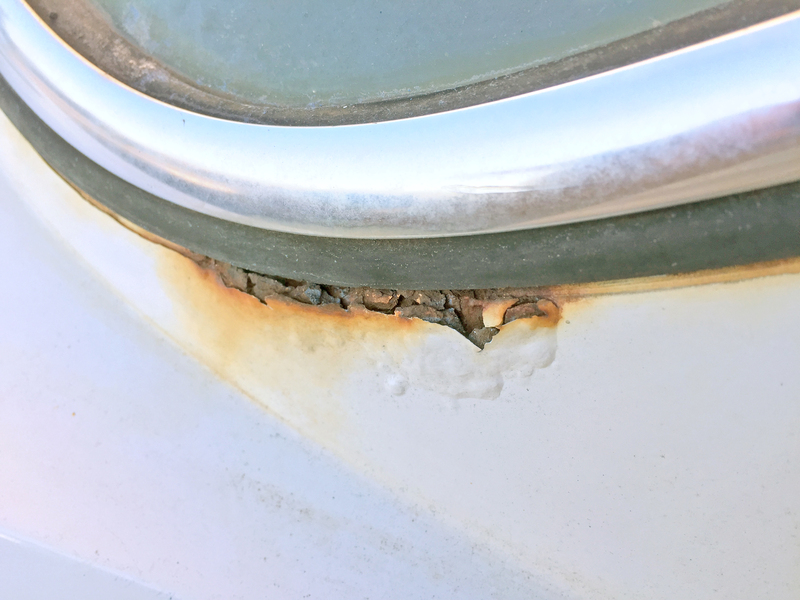 The car has continued to rust while sitting outside, Under the windows is the most worrisome part. I knew I had to pull the windows to fix the rusting correctly, I just don’t want any more water getting in for now. I’ve had to buy another car cover as the cheap one I had has been beaten by the wind and is wearing through at the corners. I plan to post quite a bit more regularly when I get this restoration started. I have found several new sources for parts and knowledge about the E9 coupes. I have yet to find anything critical that the car needs that isn’t still available. There will be something, I’m sure I’ll have to do without, or update with a more modern part, but an advantage of having a pretty complete car is that I’m not needing some hard to find bit. I did find that in spite of having a panel with A/C controls in the trunk, the car never did have air conditioning. It’s good that I have the panel, since apparently it and the switches are hard to come by. One retailer sells a full kit for installing A/C, but it’s an eye watering $2500. Still, I had expected to update the cooling from R12 if it did have it and in Texas, it’s almost a necessity if you want to drive your car in the summer. Starting fresh with new and rebuilt components will ensure trouble free use, I hope. I’ve added a long list of links to the links page, some are not working, I’ll check them and delete the bad ones over time. I’ve recently found the correct instructions for setting the timing on an M30 engine. I had used the marks in the front of the engine, which are a bit cryptic and actually only indicate TDC. Fortunately, the M30 was used in a number of cars and I have found a couple of sites with useful information about the engine and it’s settings. I found the correct information for setting the timing using the timing marks on the flywheel at the back of the engine on firstfives.org after following a link on seniorsix.org. It’s easier with two people, but not hard and should only take a few minutes. I’ve not had a chance to open the hood and actually do it as we have had all-time record rains this month and the month before causing the BMW X3 to leak around its rear doors and some house leaks as well. I will be going to Missouri in a week or two to deal with ancient family vehicles, including a 1941 Dodge WC-21 and M-29 Weasel. I’m chomping at the bit to get the E9 into the garage and start work, but parts must be purchased, shelves constructed, a work bench moved in and other assorted house details completed before I can begin. There is a meet of local BMW guys in October that I hope to be able to bring the car to, but that is looking unlikely at this point. I’ve cleaned out the garage and put the E-9 in to keep it out of the spring rains, the less water that gets inside the better. The floor was getting wet after strong storms, not sure where it’s leaking, but I want to avoid damage to the dash wood, or instruments. I still can’t get started on taking it apart to fix up, a few other household projects have priority, but I was able to have some success with the doors. 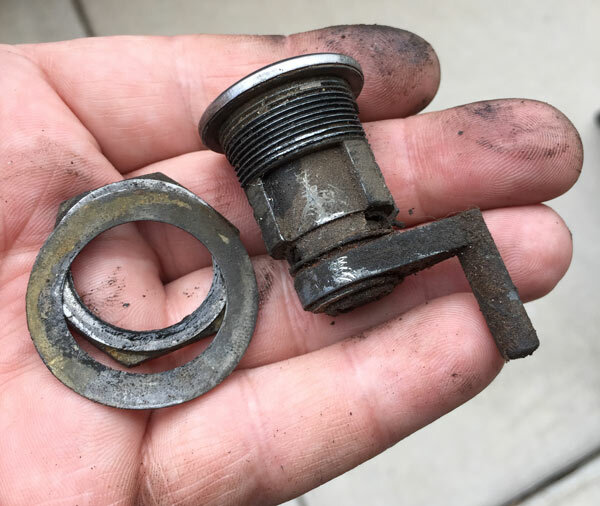 I had been afraid that the locks had been changed, or at least the ignition lock had been since the only key I have didn’t seem to work any of the exterior locks. Since the right door panel is off, I was able to see in easily and was able to remove the lock from the door with only some fiddling and swearing. The lock cylinder is about as dirty as would be expected. 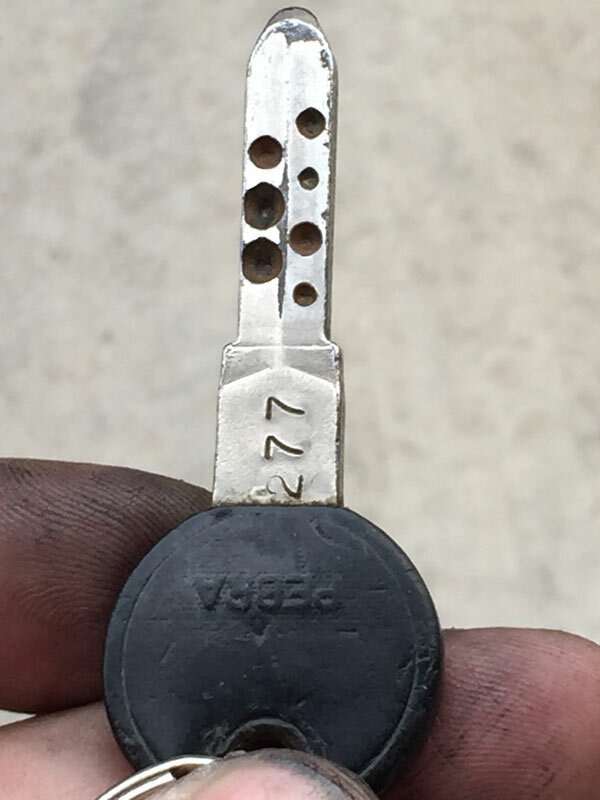 I was able to get it cleaned up and the code on it seemed to be the same as the truncated code on the key. Hmm. 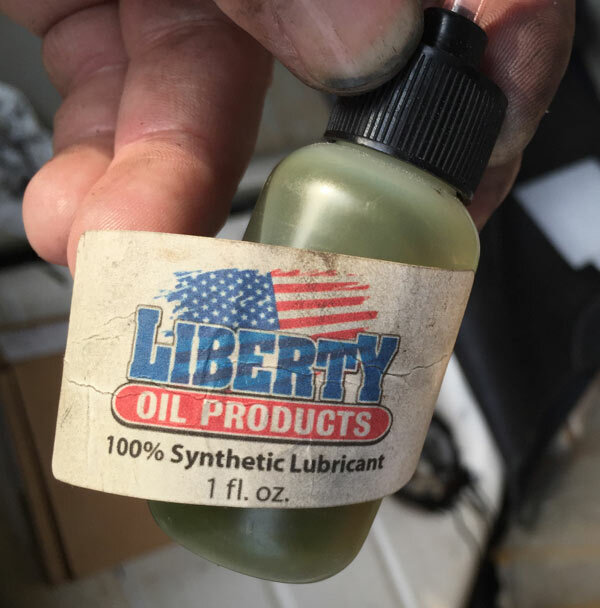 I have a little tube of synthetic oil I got on ebay that is supposed to be great for watches and other precision things. It doesn’t have an odor, and seems to be as good as the ad says it is. 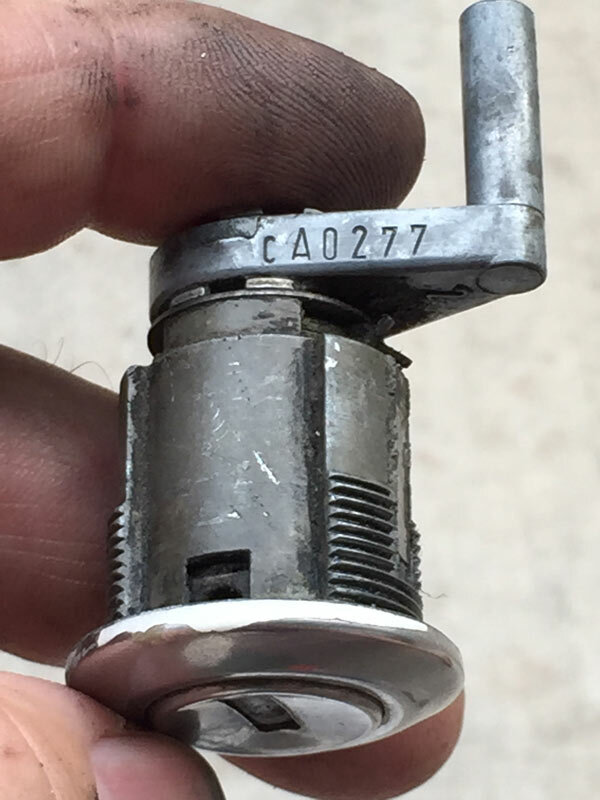 I lubed up the key and lock cylinder and within a few minutes had the lock turning freely. The trunk took another few minutes and then I was able to loosen the driver’s lock as well. However, the door internal mechanisms are still very stiff, so while the key turns, it won’t go more than 45 degrees before stopping. The passenger door lock will rotate a full 360 while it is out, but putting it back in the door gives the same issue, even after lubing up the parts that I could reach. No matter, I have to take the door off and weld up the bottom so I’ll be able to remove the innards and get them nice and free moving. I also took the time to lube up the door latch on that side. The passenger door would latch on the first click, but not latch fully. Closing it rather firmly didn’t help. I operated the latch by hand and it did progress through two stops, but very stiffly. I lubed it up and worked it a number of times and it was much freer. Now the door with latch fully most of the time, it still needs a firm push. The bumpers are rather hard, I hope I can find new ones. I was afraid that the mechanism was damaged or worn to the point that it needed to be replaced, but it seems it was just dirty. Not too surprising for a car that has been exposed to the weather in Hawaii for several years. An excellent bit of progress. Now I can order extra keys from the place in LA that specializes in these cars knowing that they will work the doors and trunk. I have received a couple of new parts to add to the pile, a new water pump and thermostat. Yay.